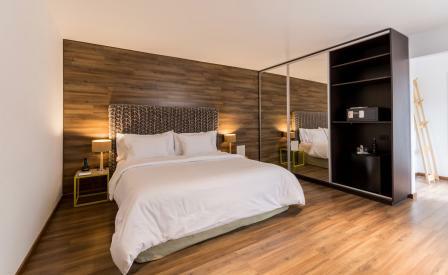 Located in the heart of the bustling historic barrio of Córdoba city, a quick stroll from the splendorous 1580s cathedral, Azur Real hotel has just emerged from a makeover courtesy of local architect Lucía Roland of Estudio Capó and Buenos Aires-based interior designer Sofía Camps. ‘The idea was not to compete with the old feeling of the property,’ explains Camps. ‘We wanted to create a balanced contrast, highlighting the virtue of the old and new, merging into a balanced space where both coexist in perfect harmony.’ As such, the 16 light-filled rooms are based on a restful neutral palette of smooth browns, beiges and greys with occasional bright lime accents that add a bit of zest. Warm wood flooring that extends onto the walls creates a sleek effect, while custom-weaved headboards and comfortable linen-covered armchairs lend texture. The new outdoor terrace with its compact pool and ample sofas, make it the perfect spot to hangout with friends for a pre or postprandial tipple.